I have repeatedly noted that objects are only visible under certain viewing angles. I have encountered this issue before. For me it was only when the center of the asteroid fell off of the screen tho. But what you have described sounds exactly what happens to me when incorrect or unrealistic arguments are put in for objects, a conflict with something, for example when an orbital path is "out of bounds" or incorrectly intercepting other orbits in my custom made systems this occurs. "To comprehend all that can be... but to not even grasp that which is..."
But what you have described sounds exactly what happens to me when incorrect or unrealistic arguments are put in for objects, a conflict with something, for example when an orbital path is "out of bounds" or incorrectly intercepting other orbits in my custom made systems this occurs. I do not think so. You can watch the script that I use to generate the asteroid. It does not contain any illegal parameter. if 'ParentBody "Earth"' is replaced with 'ParentBody "Earth-Moon"', the asteroids appear normal. Only the orbital periods are then wrong. parameciumkid, No offence taken . Did you installed the most recent ATI driver? Try clean driver and SE install, try with and without atioglxx.dll in the system folder. I've done almost everything before asking for help. The first step - I've installed the latest driver for my system ( XP ) 14-4 . As I recall the problem was there too , but I didn't recognise it well because of atmosphere masking the tracks of the problem ( I wasn't aware of how detect it at the moment ) . Then I was to return to version 12-6 with complete deletion (aka DDU) Cause 14-4 was messing heavily with the soft installed ( as I mentioned first and foremost that is my workbench PC not a home one ) . And as you saw I've installed the previous cleaner than clean version of 0.973 and it has that glitch as well . ps. And I didn't bring up how much I've tinkered with main.cfg used either native and tweaked . pps. Now I'll try and run SE 974 from scratch (post#1) just to be thorough completely but I'm 99,9% certain it's a dead end ( in that case 0.973 would've worked too as I said before ): UPDATE Nope, No dice . Is it just me or is anyone else having pretty bad fps drops near black holes? And they also look kinda distorted. Breno - that blackness in the distortion effect looks like a failure to render the off-camera views to the distortion shader - it's not rendering the skybox that the shader uses to bend light from objects outside your field of view. The lag is possibly coming from that process failing, too. I'm not sure how that helps you... but I thought I ought to say what I saw. My GPU is a Intel HD Graphics 5500, with 6223 MB under "Total Available Graphics Memory". Is that how I'm supposed to report it? 'Cause I've never had to look up my specs before. Is that how I'm supposed to report it? 'Cause I've never had to look up my specs before. The best method is to post the SE.log file. 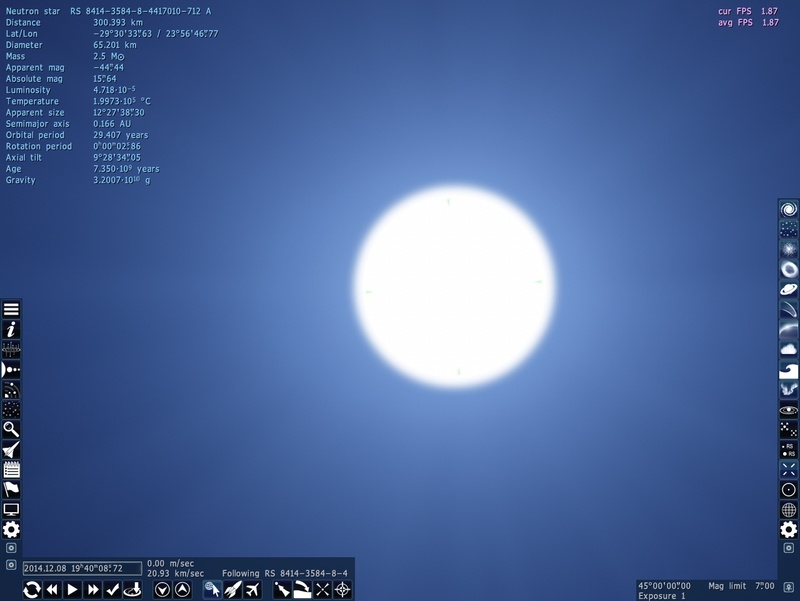 It is located in the folder \(SpaceEngine)\system. This file contains all the necessary information. Hello, everyone. I've recently downloaded the RC1 and I've been looking for rocky planets with oxygen levels akin to those here on Earth, up to no avail. I'm wondering if such planets are currently non-existing or just really rare. And I'm talking about free-oxygen levels, not the oxygen on H20 which is actually commonly found on many planets. Ah, that's good to know, thanks. Thanks! Apparently it was some corrupted file or something like that. I reinstalled SE and the strange rendering problem got solved, but the lag persists, and I just figured out that neutron stars have the same performance problem. Pause time - SE will stop update the skybox used in distortion shader. 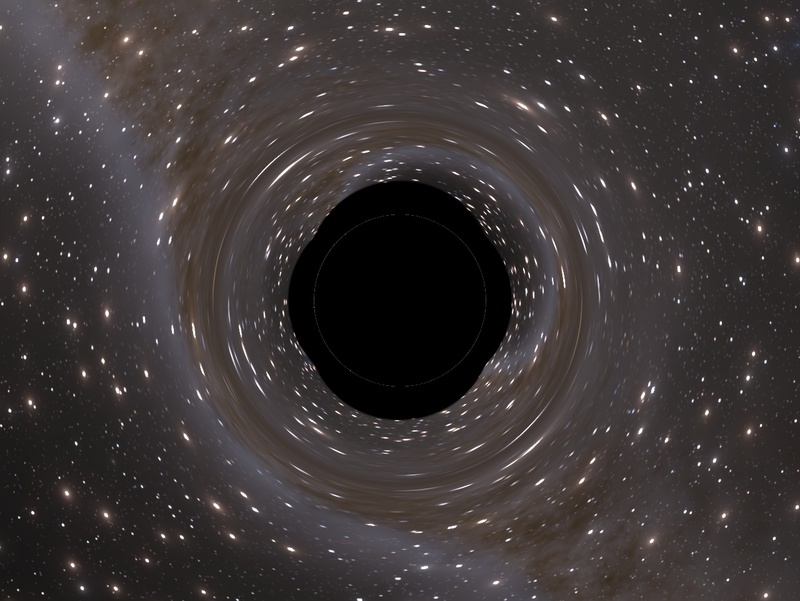 Solitary black holes and neutron stars must have no performance drop, because their skybox updated once. also, a lot of smaller generated asteroids rotate all lopsided and off center. they spin really strange. never stop imagining beautiful things.